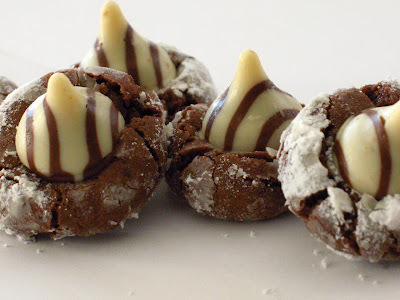 These aren't just any chocolate crinkle cookies. Chocolatey and sweet, these not only look good but taste delicious! I love to give them as gifts for Valentine's Day or Christmas, and with all the various types of Hershey's Kisses out there, you can change the flavours to your liking. They pack well and also freeze well, which makes them perfect for care packages or gift giving. Just be careful when you put the kisses into the warm cookies-they will become soft as well, and you need to give them time to set up. Beyond that, the hardest part will be keeping yourself from eating them all. 60 Hershey's Hugs (or you could likely try various flavors of Hershey's Kisses-like mint, chocolate truffle, peanut butter, and almond) for 60, you need approximately 2 packages. Melt the chocolate in a double boiler over simmering water. Allow to cool slightly. In a separate bowl whisk the sugar,eggs, vegetable oil, and vanilla together. Add to the melted chocolate, whisking to incorporate. In a separate bowl, whisk together the flour and baking powder. Add to the chocolate mixture in three additions, stirring well after each until a soft dough is formed. Cover the bowl with plastic wrap and place in the fridge for about 2 hours. Sift icing sugar into a small bowl. Roll 1 tsp of the dough into a ball and then dredge in icing sugar. Repeat with remaining dough. Place the balls 2 inches apart on a baking sheet and bake at 325 F for 10 minutes, until the sides are firm and the tops are cracked. **I noticed that at this point, they didn't appear to be done and I was tempted to bake them longer. The tops were soft and squishy! But they do firm up once they cool, so 10 minutes really is all you need or you may over bake these babies. Overbaked ones are like little hockey pucks. Perfect ones have a brownie-like texture. Do not remove the cookies from the pan immediately. Let the pan sit for about 5 minutes before you press a candy into each of the cookies, otherwise the chocolate may melt. Remove cookies to wire rack to cool. Cookies can be stored for up to 5 days in an airtight plastic container, or frozen for up to 2 weeks. Right. Like they'd last that long.